With this module you can get from section extracted from points cloud the vectorial section composed of plylines and arcs. All this in a very short time and with direct control. The vectorization is performed on a track defined by the user (also usable for more sections), with tolerances of inclusion of the variable points, in a fast and modifiable way, even at different times. 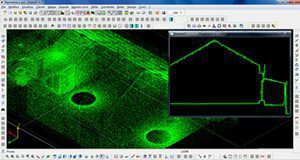 Vectorized sections calculation is automatic by least squares method whose value is reported on the various elements of the resulting polyline, for a numerical evaluation of the quality obtained. The final result can be exported in DXF, in two-dimensional or three-dimensional form.